Manchester terriers are perfect candidates for martingale dog collars. Depending on your pup either 3/4" or 1" wide collar would be a good choice. Pink Puppy martingale collars are available with either a fabric or a chain martingale loop. 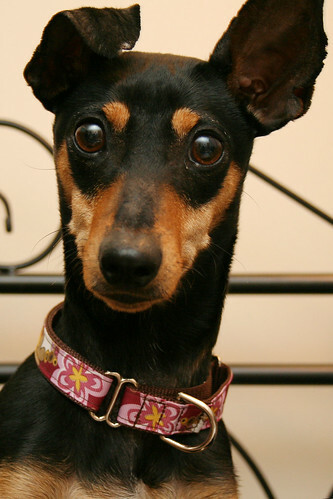 For the more sensitive skin of many Manchester Terriers, we recommend selecting a fabric loop martingale collar. This is Samantha, a Manchester Terrier who was rescued by Humane Investigators from being neglected and living outside in a very bad neighborhood. We took her in as a foster dog and she has since found a wonderful forever home. Samantha is wearing a Blast From the Past Martingale Collar with a fabric loop and no buckle. It works wonderfully because her neck and head are virtually the same size and she had previously slipped out of regular collars. We also later made her a matching dog harness and leash which she wore when she went to adoption events and was the envy of all the other dogs there (which she thoroughly enjoyed). Below is a video of her shortly after she was rescued. She is such a happy little girl.